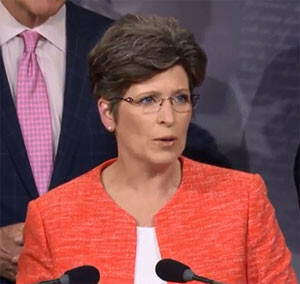 Iowa Senator Joni Ernst, a Republican from Red Oak, voted for the Senate transportation bill today. Ernst talked with reporters before the vote, and says she decided to move ahead after addressing some questions with Iowa groups. “With the assurances that have come from the various groups in Iowa — they are okay with the measures that are in the bill — so, I am going to support it. I think we have to have a multi-year bill,” Ernst says. Ernst was asked about concerns raised by some over 18-year-olds being allowed to drive trucks. “I haven’t seen any studies to contradict that. I think younger that drivers are fine,” according to Ernst. “We have laws in place already that will be followed, so I feel very confident.” Ernst says the bill isn’t perfect, but she says they needed to take action.”I look at this as a good bill, again a multi-year bill, that’s what we are striving for, and hopefully we can find a consensus on it,” Ernst says. Iowa’s other U.S. Senator, Republican Chuck Grassley, also voted for the bill. The U.S. Senate also passed a three-month extension of the current funding bill to keep transportation money available until a long-term bill is passed. The U.S. House has left for its August recess, so a long-term bill would not move forward until the fall.